The Oceana County Clerk's office lists three primary methods to obtain birth, death, and marriage certificates: in person, through the mail, and online using VitalChek. Visiting the County Clerk office in person is the primary method to research records, rather than obtain physical copies, although they do serve the latter role, as well, and the order forms for in-person and mail-in requests are the same. Birth, death, and marriage records are all available starting in the late 1860s, and naturalization records stretch from 1856 to 1956, however those are not complete. All records are open to the public except for birth certificates dated from 1902 to the present. 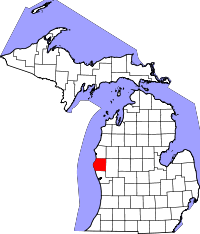 For more genealogy resources, the County recommends the Oceana County Historical & Genealogical Society, a group of volunteers who assist in genealogical and vital records research either for free, or for a fee, depending on the nature of requests.